Siralim is my kind of retro-themed nostalgic rush. Where others get stuck right in to all those pixel-heavy platformers that the indie space is so inundated by, I’d rather kick back and rip through something just like this. Back when I was a kid, there was a shareware demo, Castle of the Wind, that I found to be enormously addictive. It was, really, nothing more than a roguelike Nethack clone, but the aesthetics, enemy design, and so really drew me in. The demo itself (the first chapter of a two chapter commercial game) was meaty and large, so even though I never had the opportunity to play that second chapter, I was able to loop myself through what I did have access to over and over again and still be satisfied with what I got. They just don’t make games like that any more. Except that they do, as Siralim proves. Though the game itself plays nothing like Castle of the Wind, I found myself hooked to this for many of the same reasons I found that game so engaging as a youngster. And by that I mean everything about Siralim is so simple, but so perfectly executed. Siralim is a procedurally-generated dungeon crawler - or roguelike, basically - in which players jump into a “level”, have an random “master” objective to complete (be that killing X enemies or collecting Y objects from the environment), before jumping down to a deeper level. Because the levels are procedurally generated, they are really nothing more than rooms and corridors, with randomised loot, enemies, and traps dotted around the place, and though this means the entire game becomes one giant grind, it is exactly that that is going to tickle the nostalgic itch for the people that would be interested in playing this in the first place. Some people like pixel-perfect jumping and can play Mega Man until their very muscles twitch to the rhythm of the game even when they’re not holding the controller. But me? I like the thrill of finally hitting that next level of experience after an hour slowly playing through battle after battle. But Siralim is much more than a standard ‘crawler. It’s also Pokemon-like. Your own character doesn’t actually fight his own battles here. Instead, he hurls magic from the back lines while monsters that he defeats in combat do the physical grunt work for him. This makes encountering new enemies a real delight, because it means that each new enemy is also a potential new ally. To acquire a new ally players must draw “cores” out of their enemies that they fight in battle. After acquiring a few of these it’s possible to head over to a summoning circle and bring into being that same monster. 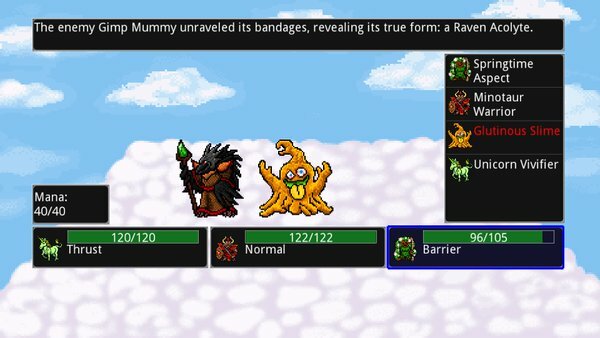 Each monster has a limited progression curve (mostly just becoming more powerful and able to take more punishment with experience levels), but each monster has distinctly different abilities, and being able to form an effective party is important, because like all retro-themed roguelikes, Siralim likes to punish poor play. Sitting underneath all that is an obscene amount of micromanaging to get stuck into. Artifacts such as weapons can be earned, powered up, and provided to monsters to up their skills. A ridiculously deep perks system means that every time the player’s hero levels up you’ll need to carefully consider how to develop him. There are multiple resources to juggle and it’s possible to upgrade the castle that acts as a the hub between worlds to give you different dungeons to explore (new monsters to acquire!) and other facilities to make your own adventuring just that little bit more manageable. 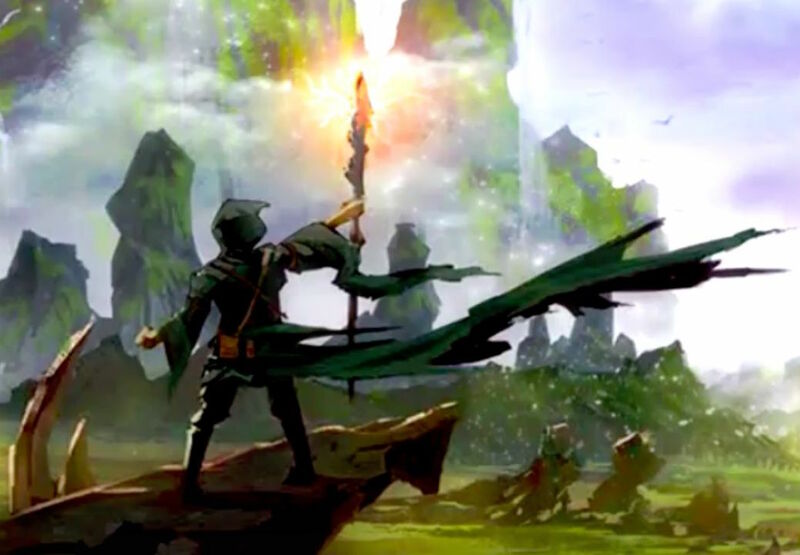 It’s a little overwhelming at first, and though the game tries (really) hard to walk new players through these systems in a logical and accessible manner, really the only way to learn Siralim is to simply experience it, fail fast, and improve. There were systems that I didn’t really bother with at first as I learned the basics which, as I understood them better, helped my quest out a great deal, and that’s okay - they weren’t essential functions in themselves and figuring them out at my own pace was part of the appeal. Initially befuddling, once all the systems finally start to click, they really click. There’s a point in Siralim where the rhythms of the game start to connect in such a way that it all becomes really addictive. It is happy to take its time with dolling out experience levels, and progress feels like something earned as a result. There’s not a significant narrative backing what’s going on, but because there is so much personalisation to the experience thanks to the control you have over which monsters you take into dungeons with you there’s still a great sense of ownership and personal investment over what’s going on. 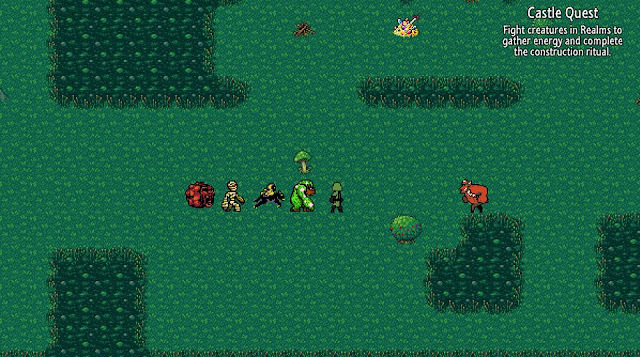 But what’s really good about Siralim is that it is much more than a retro game. For all the lack of animation in combat (really, there’s not much more than flashes as enemies get hit until they fade away after being defeated), and for all the basic pixel work that has gone into those sprites and environments, Siralim isn’t a purely retro experience. Retro for the sake of being retro doesn’t really work for me - I found Pier Solar to be a relentlessly irritating experience last year, for example. Siralim offers modern systems and design elements, and then dresses things with a retro theme. Though it has a lot going on under the hood, this is a game where all the information is made readily accessible and readable. The user interface is actually something that deserves a lot of praise because Siralim would have been truly painful if it wasn’t so accessible. Really, I could see this work just as well if it had a modern aesthetic applied to it; something that I couldn’t say for a large number of other retro-themed games that rely heavily on tapping in to nostalgia for their success. There’s really not much else that can be said about this one. It’s not an earth-shattering work of art. Its narrative relies heavily on players having grown up with roguelikes and pixel graphics in their RPGs. Its systems are complex but rewarding. What Siralim is, ultimately, is a great deal of fun for a very select audience, and it gets there because it straddles the line between being something authentic, and something that understands that some design elements are best left in the past.